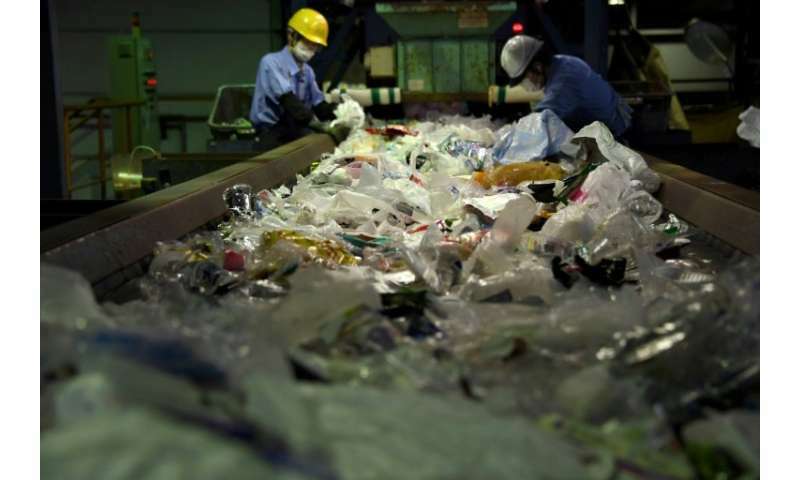 Japan said Thursday it was facing a growing sea of plastic waste with limited capacity to process it after China stopped accepting foreign waste imports. The environment ministry said about a quarter of major regional and municipal governments surveyed reported seeing accumulating plastic waste, sometimes going beyond sanitary standards. The costs of processing waste plastic were rising, according to more than 100 local governments and 175 waste processing firms that responded to a ministry survey. The world's developing nations are also scrambling for ways to process plastic refuse after China stopped accepting it. Nearly three-quarters of all plastic waste produced globally since 1992 has ended up in China and Hong Kong, according to a study in the journal Science Advances. But since January, China has closed its borders to most paper and plastic waste in line with a new environmental policy pushed by Beijing. Before the ban, Japan exported about 1.5 million tonnes of plastic waste per year, most of it to China. The Japanese ministry said it will expand domestic capacity to process plastic waste, while also preventing illegal dumping. The government also intends to boost efforts to encourage recycling, the survey added.